100,000 trees are to be planted across Sheffield, it has been announced, but the fate of those on the city’s streets is yet to be decided. Sheffield Council has unveiled its draft Trees and Woodlands Strategy, setting out how it plans to protect existing trees and plant new ones in green spaces across the city over the next 15 years. But the proposals, which are likely to be rubber stamped by cabinet members next Wednesday, do not cover the city’s estimated 36,000 street streets at the centre of the highly divisive felling saga. Work to remove and replace many of those trees has been on hold since March, after protests gained national attention, and council chiefs are still locked in talks with campaigners from Sheffield Trees Action Groups (STAG). Sheffield’s highway trees, the council says, will be the focus of a separate ‘sub-strategy’ which is being drawn up in conjunction with ‘partners in the city’ and is due to be unveiled next year. In the meantime, the existing proposals, drawn up following consultation in 2016, outline 53 actions to protect and enhance the city’s trees. There is a particular focus on improving access to and use of green spaces in Sheffield’s more deprived neighbourhoods. Sheffield has approximately 4.5 million trees, according to the council, which says it is responsible for managing around 2.7 million of them. 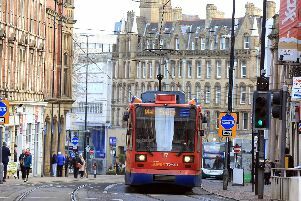 The latest strategy includes new data, which the council says has been obtained using Forest Research’s i-Tree Eco survey, showing the 105 trees per hectare in Sheffield is much higher than the average of 58 for towns and cities in the UK. It also claims the 21.6 per cent canopy cover they provide in the city's urban areas is much greater than the 15 per cent in Manchester or Glasgow. Councillor Mary Lea, cabinet member for culture, parks and leisure, said: “We recognise our responsibility to provide rich, diverse, healthy and attractive green spaces across the city and the need to invest in our natural assets. “We have set out clear and achievable actions that will help us to realise this vision not only for the city’s trees and woodlands but also the people who live, work, study and play in Sheffield. “The plans we have developed will help to address health inequalities in Sheffield, by improving green spaces in areas of the city where increased activity and access to the outdoors will have the most impact on health and wellbeing. The council said it had worked with both the city’s universities to develop research to support the strategy. One of the biggest beneficiaries could be the Shire Brook Valley nature reserve, where a potential £100,000 investment is proposed to improve the ‘outdated’ visitor centre and provide other facilities. The strategy also sets out plans to tackle antisocial behaviour in the city's woodlands, which include working with police to crack down on illegal off-road bikers and investing in new technology to catch fly-tippers. However, he accused the council of reneging on an agreement by publicising this strategy before talks over street trees had concluded. “At the council’s suggestion, we agreed we wouldn’t undertake any press activity while the discussions and engagements are ongoing,” he said. It is understood progress has been made in the latest round of talks between the council and tree campaigners, and - while the two sides are not expected to agree entirely - a joint announcement is thought to be imminent.